I just met something wonderful called Spicy Ranch Dressing. Remember when I went to the Women of Faith conference with my girlfriends and got super silly? It may have been in part because of the meal we ate across the street from the arena before the event. Yes. I blame it on the specialty pizza. It was that good. Who knew you could put thin slices of red potato on a pizza and turn out something amazing? The pizza had some sort of red-ish sauce drizzled all over it, and that very sauce is what made that pizza taste so good. Well, that and the bacon. Everything is better with bacon. Of course I came home determined to replicate the sauce. Every potato needs that sauce, whether it’s on a pizza or not. So I looked it up on the restaurant website. It described the pizza blah, blah, blah “with spicy ranch dressing.” Bingo. So I played. The result is too easy. Make this and forever drizzle it over your baked potatoes, your chicken, and sure – even your pizza. See how easy that was? 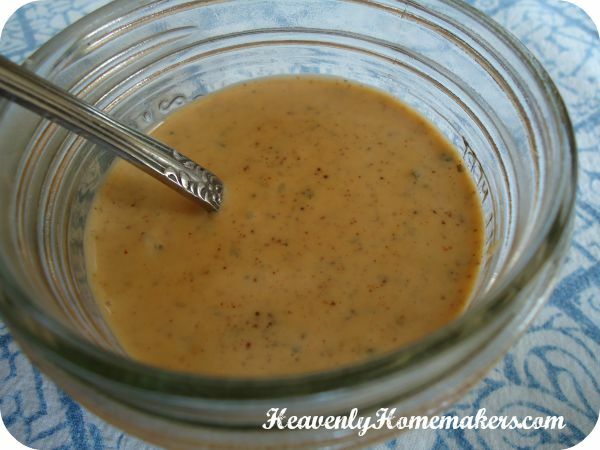 You’ll need my homemade ranch dressing recipe. Want it to be spicier? Add more hot sauce, chili powder, or cumin. Want it to be less hot? Cut down the hot sauce, chili powder, or cumin. Really, it isn’t difficult. Give me more ideas besides potatoes, chicken, and pizza for this dressing. Think it would taste good on a salad? (Yes.) Ooh, maybe with Sweet Potato Fries. Oh my goodness, yes. What else?? If you decide to recreate the entire pizza at home, I’m coming over! I have been making spicy ranch for a few years. I use Frank’s hot sauce and we love it on our taco salad! Can’t wait to try it on pizza now. Oh yes, great idea. This will taste awesome on taco salad! Um…yes! That is a rockin’ idea! Ha, ha. Yes – husbands and sons everywhere adore the bacon recipes. I adore your simplicity – it’s saved me more than once when in a time crunch. I’m currently on a ranch craze. Hubby is ALWAYS on a spice craze. Can’t wait to try this one! Excellent recipe idea and a fun post to read! Thanks. 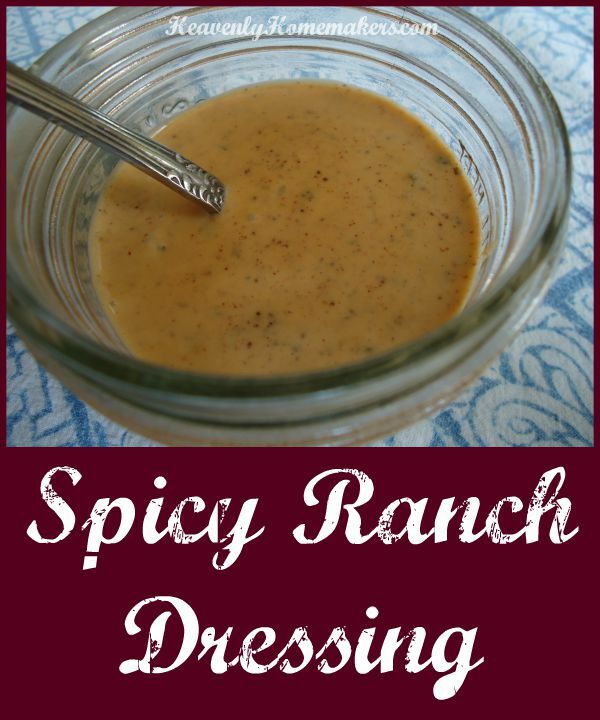 I’ll bet Spicy Ranch Dressing would be awesome in your pasta salad. Or in place of ketchup with fries. Oh my goodness this is yummy! I used chipotle chili powder instead of regular chili powder and even my husband (who does not like ranch dressing) loved it! I must make this. Thanks.